Sion’s driverless public shuttle buses celebrated their first anniversary of experimental operation in the mainly pedestrian precincts of the Valais capital on 23 June 2017. 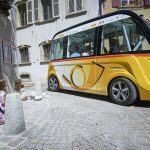 Switzerland’s PostAuto/PostBus, responsible for the 11-seater yellow electric vehicles built by the French company Navya, said the two SmartShuttles carried more than 21,500 people through the Sion city centre during the year. That averages at 69 per half-day (the buses run only in the afternoon and not every day). But PostAuto stresses these passengers included “several thousand who have come especially from other parts of Switzerland and from abroad”. Another 20,000 passengers travelled on the SmartShuttle at exhibitions abroad during the year. “A genuine tourist attraction, they have also attracted the attention of numerous companies, both at home and abroad, as well as numerous public institutions, in particular municipalities and associations, interested in testing this technology in situ,” PostAusto adds. The experimental service — the first in Switzerland — is due to continue until 31 October 2017. PostAuto and the authorities are already considering an extension to explore other options such as a bus “on demand” function. The primary utilitarian value of the yellow shuttlebus has been to take heavily-laden shoppers through the pedestrian streets to the conventional bus stops. They were taken off the roads for two weeks after an accident at the end of the day on 21 September. A shuttle bus hit a delivery van when the SmartShuttle’s sensor failed to recognize the van’s protruding tailgate. All the buses have an attendant who can override the controls, but on this occasion he failed to spot the danger and only intervened when the bus stopped. Both vehicles suffered minor damage. In the software, the the 3D map that serves as a navigational map for the shuttle has been adjusted several times, PostAuto notes. 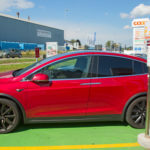 The fleet management software developer is BestMile in Lausanne and researchers at the Federal Polytechnic EPFL are testing and improving the algorithms that control the automated shuttle fleet. A reporter for Le News took the shuttle in the first week of its operation. His report is here.